Soluble Fiber Foods, Soluble fibre Food List, Recipes. Dietary Fibre is a plant based nutrient also known as Fibre or roughage. Plant based nutrients come from fruits, vegetables, whole grains, dals and tubers. There are two parts to it, soluble fibre which is sticky and dissolves in water and insoluble fibre which does not dissolve in water and goes through your stomach without being broken down. Think of Oats when you add water or milk to it. It gets sticky or gooey and that is what Soluble Fibre is. Hence the soluble fibre attracts water and slows down digestion. Having soluble fibre which turns like a gel like substance in the intestines can reduce your bad cholesterol (LDL cholesterol). Getting your soluble fibre through foods results in you getting more nutrients from plant based foods versus taking supplements. There are so many healthy oats recipes to have. Oats khichdi far better than regular khichdi which is made of rice. Oats upma made with green peas is far healthier than rava upma. Oats are a great way to start a healthy breakfast in the morning with oats almond milk with apples , healthy peanut butter with oatmeal and almond milk or oatmeal almond milk with oranges. We have used barley extensively in Indian cooking. From barley khichdi, barley and moong dal khichdi to barley idli to mysore barley dosa. Also mushroom barley soup is a great way to start your meal. A healthy diet should contain both Soluble Fiber and Insoluble Fiber. Total Fibre or Dietary Fibre is a combination of Soluble Fibre and Insoluble Fibre. The US recommended daily allowance (RDA) for Women (18 to 50) is 25 grams and 21 grams (51 years plus). US RDA for Men is 30 to 38 grams. The thumb rule is that for every 1,000 calories consumed you need 14 grams of fibre. 1. Reduces Cholesterol: Soluble fibre may reduce the absorption of cholesterol. Hence lowers total cholesterol and LDL cholesterol (the Bad cholesterol) therefore reducing the risk of heart disease. 2. Good for Diabetic: Regulate blood sugar for people with diabetes as it slows down the blood sugar release. 3. Soluble Fibre helps in better absorption of nutrients. 4. They bind with fatty acids. 5. Good for Weight Loss : Keeps you lean. As soluble fibre turns sticky when mixed with water, it delay stomach emptying time which hence makes you feel fuller and makes you then eat less. 6. Soluble fibre is great to treat diarrhoea and constipation. 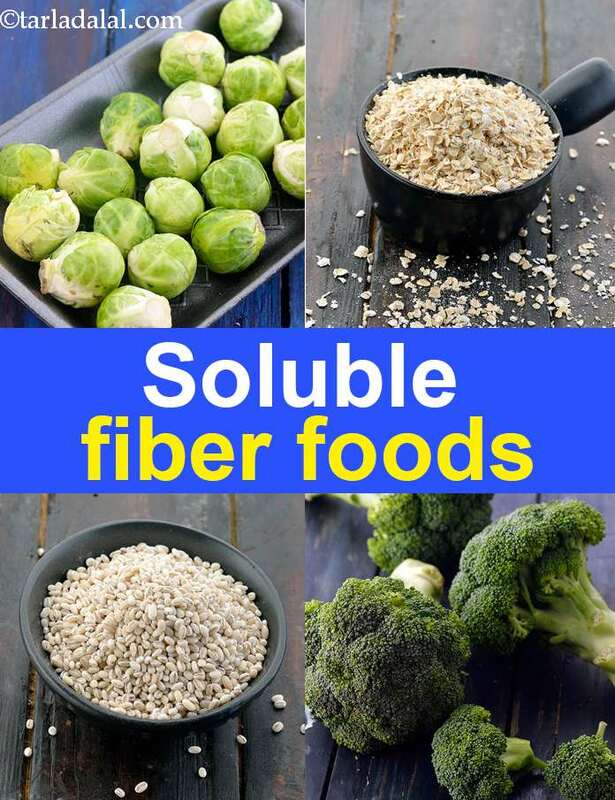 Enjoy our Soluble Fiber Foods, Soluble fibre Food List, Recipes and other fibre articles below.